Marta McDowell lives, writes and gardens in Chatham, New Jersey. She shares her garden with her husband, Kirke Bent, their crested cockatiel, Sydney, and assorted wildlife. 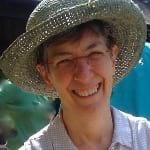 Her garden writing has appeared in popular publications such as Woman’s Day, Country Gardening and The New York Times. Scholars and specialists have read her essays on American authors and their horticultural interests in the journals Hortus and Arnoldia. Marta teaches landscape history and horticulture at the New York Botanical Garden where she has been twice awarded "Instructor of the Year." A popular lecturer, she has been a featured speaker at locations ranging from the Chicago Botanic Garden to the Smithsonian Institution to the Beatrix Potter Society's Linder Lecture at the Sloane Club in London.